Record Store Day 2015 exclusive! 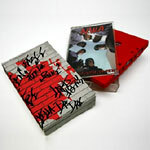 Limited edition red cassette in a special edition graffiti slipcase. NWA's classic first album, now on cassette! The album has been viewed as the pioneering record of gangsta rap and has had an enormous impact on the evolution of hip hop.